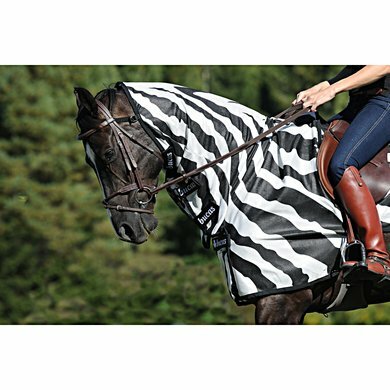 The Buzz-Off Riding blanket is a fine-meshed, two-piece fly-out blanket. 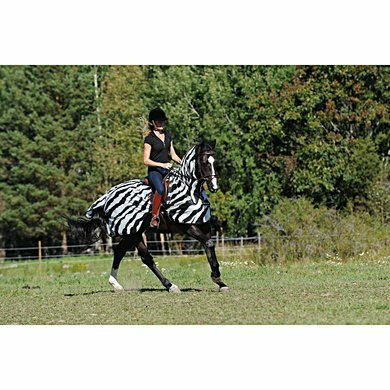 This blanket is made of ultra-fine polyester that protects against the smallest insects and the blanket provides extra protection against UV radiation. The loose neck protects the neck, chest and shoulders of the horse. 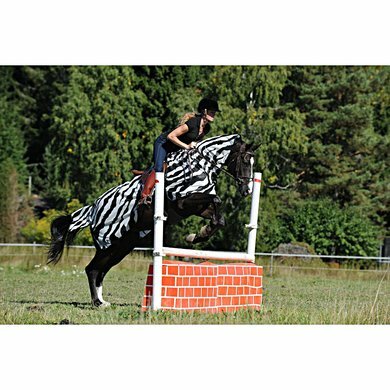 At the neck is an elastic band, which runs over the forehead of the horse. This band holds the neck part in place. The neck can be attached to the blanket at the level of the withers. 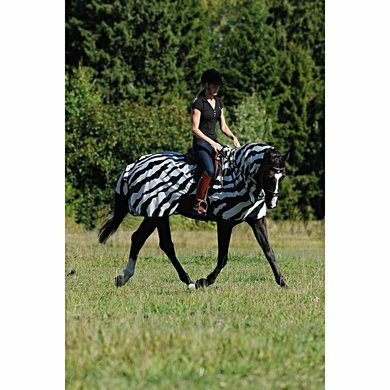 This blanket is suitable for riding with horses because of the saddle cut-out. In addition, this blanket has a tail flap for extra protection. I already had a Buzz off-blanket from Bucas before I had a flying blanket. 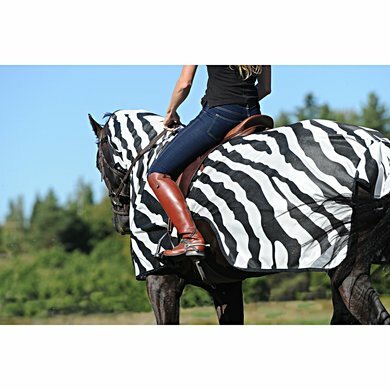 This blanket is very useful during the summer months on outdoor ride, works clearly against flies and flies. You have to be careful when washing that the streaks on the fabric do not fade. Great fit and the fabric seems to be able to take a beating. 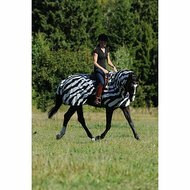 Ridden several times with the blanket and the horses suffer considerably less from flies and flies. 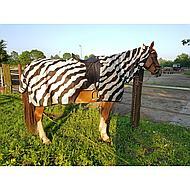 The blanket has a good fit, is large enough on the forehand also for the somewhat wider horses. The blanket remains super while driving. Equally puzzling to put the blanket on for the first time, there is no building plan. Unfortunately, the recess is too small for my 18 inch saddle. Question: The sizes are indicated as M / L / XL, how do they correspond to the normal blanket sizes 195/2015 etc.? Answer: The size S corresponds to 125/168, M with 135/183, L with 145/198 and XL with 155/206.